Simple passing accuracy exercise for a small group of kids as seen during Futsal training with Coach Izabella. Here we have 3 different coloured cone gates around the edge of the box. The size of the target will depending on the age and ability of the group you are working with. Usually 2 - 3 yards is sufficient. The basic structure of the drill is that the first person in line &apos;Player 1&apos; passes to &apos;Player 2&apos; and calls a colour. 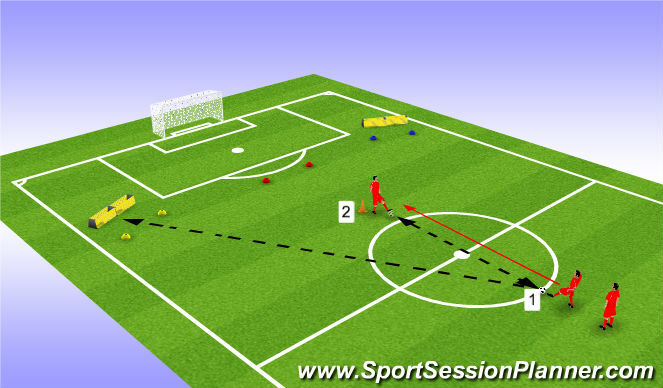 &apos;Player 2&apos; receives the ball, turns and plays a nice firm pass across the ground through that coloured gate. They then retrieve the ball as &apos;Player 1&apos; takes their place and awaits the pass from the next person in line. You will notice the &apos;rebound boxes&apos; behind the yellow and blue gates that have been placed in order to reduce the chance of balls flying everywhere. You can replace these with whatever you have available that will serve a purpose: a bench turned on it&apos;s side, a line of backpacks or even another player that you can figure out how to include in the rotation. 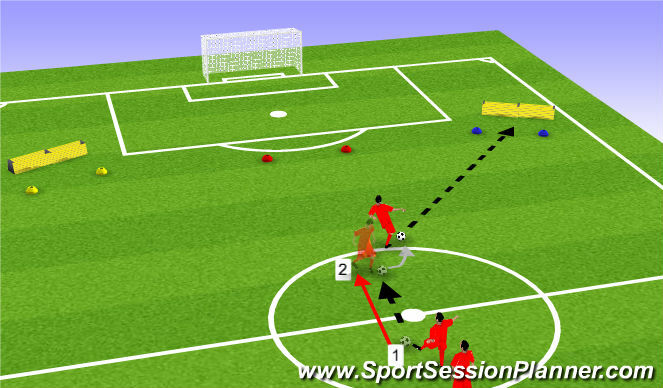 In the example above, the drill has progressed a couple of steps in order to test a player&apos;s passing accuracy over a greater distance. Player 1 passes to Player 2 who then plays it back and calls a colour. Player 1 must hit a first time pass across the ground through that gate. Notice how Player 2&apos;s cone has been moved further from Player 1 as well as the line of players having been moved back too. Again, Player 1 then becomes Player 2 as Player 2 retrieves the ball. This game can be adapted to teach shooting technique with a ground shot with the laces the focus. You can have players shooting into the goal as a target as well as creating opposition in a 1v1 situation.